To read the New Year's Message of Msgr. Oscar V. Cruz, DD, the Archbishop of Lingayen-Dagupan, kindly click this link. To read the Pangasinan translation of the same message, kindly click this link. And to see the current homiletic service for this cycle B, you can visit the Liturgy Section of this site. The following is the list of priests assigned in the Parish of St. Fabian, Pope and Martyr, since 1718 to the present. The list was taken from the research work of Msgr. Rafael S. Magno, Jr. on the history of San Fabian, and of Ms. Lourdes S. Patungan, a parishioner. 1802-1833 Fr. Domingo de la Pena. (He died about the end of 1835. His successor(s) until 1841 was not officially appointed. Members and guests of the Apostleship of Prayer celebrate the 100th Year Foundation Anniversary of the organization with Msgr. Renato P. Mayugba, DD, Auxilliary Bishop. The Apostleship of Prayer of the Parish of St. Fabian, Pope and Martyr celebrated its 100th Foundation Anniversary last 28 December. Since 1908, the parishioners had organized themselves to observe and spread the practices of the Apostleship of Prayer as well as the spread of the devotion to the Sacred Heart. The program to celebrate the anniversary started with a prayer by Sis. Salome B. Sison, the Vice-President, followed by the singing of the Lupang Hinirang led by Sis. Leticia Z. Somintac. The Parish Priest, Fr. Oliver E. Mendoza, welcomed the members and the guests of the celebration. Mrs. Alicia Z. Gubatan introduced the Guest of Honor and Speaker, Msgr. Rafael S. Magno, Jr, Vicar General and the Parish Priest of the St. John the Evangelist Parish (Dagupan City). He was also the former parish priest of San Fabian for 16 years. 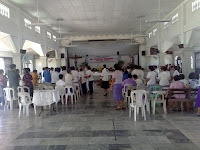 A Eucharistic celebration capped the whole affair with Msgr. Renato P. Mayugba, DD, as the celebrant and homilist. The following are the Officers of the Apostleship of Prayer of San Fabian Parish: Mrs. Filomena Z. Sagun, President; Mrs. SAlome B. Sison, Vice-President, Ms. Francisca S. Zambrana, Secretary, Ms. Nunila S. Quiros, Treasurer, with Mrs. Paciencia E. Verzosa and Ms Lourdes L. Patungan as Advisers. The theme of the 100th year foundation anniversary was: "The Apostleship of Prayer: A Way to Sanctity for the Third Millenium". Some of the pictures of the happy and grateful families who received the gifts from the generous hearts of families of San Fabian Parish! The parish once again embarked on a gift giving program for the least fortunate in the parish. The appeal for gifts to families by families was made by the parish priest, Fr. Oliver E. Mendoza, on the first day of the nine day Misa de Gallo. "So many of us are now feeling the hardships and difficulties brought about the economic crisis. Yet, there are still so many among us who are in a more difficult situation than in what we are. They are the ones calling for our help!" Thus the appeal of Fr. Mendoza. "Give. Share this Christmas," he further said. The response was overwhelming as many picked from the basket containing the names of the families who will receive the "family gifts". The family-recipients were picked from the different barangays of the parish; families who are most in need; families who could barely cope with the daily grind of life. The last gifts were given to the parish on Christmas day. The first batch of gifts were distributed to the families on 26 December. The gift giving would continue until 29 December. Fr. Oliver Mendoza, Bro. Tony Supremido, the BEC coordinator, several youth ministers and Bro. Bernie Solis who generously lent his driving services and his truck, personally gave the gifts to the family recipients. 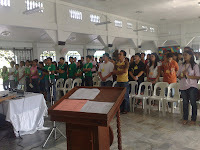 The Parish of San Fabian hosted the biennial Archdiocesan Youth Ministers' Assembly last 5-7 December 2008. Almost 200 youth ministers from the different parishes of the Archdiocese gathered together to asses and plan the Archdiocesan youth programs for the next two years. The assembly was headed by Rev. Fr. Manuel S. Bravo, Jr., the Youth Apostolate Director and Sis. Janice Hebron, the Archdiocesan Youth Coordinator. 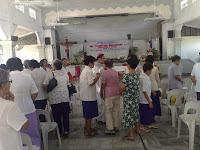 The delegates were welcomed by the different host-families in the parish. Many of the host-families expressed positive and uplifting experiences with the youth ministers who stayed with them even for just two days. These host-families responded generously to the appeal of the parish priest, Fr. Oliver E. Mendoza, to open their doors to the delegates. The theme of the assembly was: "... the word of God lives in you." (1 John 2,1). At the end these youth ministers have but one thing in their hearts: " I am a Youth Minister, drawing and sharing life in God's Word, witnessing to the world." Msgr. Renato P. Mayugba, DD, the Auxiliary Bishop of Lingayen-Dagupan celebrated the opening mass on 5 December, together with the host families and the youth delegates. 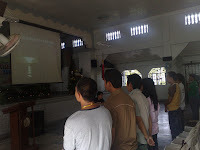 The youth ministers proceeded to the Parish of the Holy Cross, Laoac, Pangasinan in the morning of 8 December 2008 fro the launching of the Archdiocesan Youth Day 2009 which will be held in Laoac, Pangasinan. Msgr. 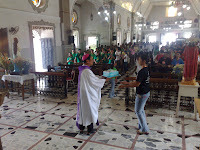 Renato P. Mayugba receiving the gift from the youth ministers of the Archdiocese of Lingayen-Dagupan during the mass last 5 December 2008.